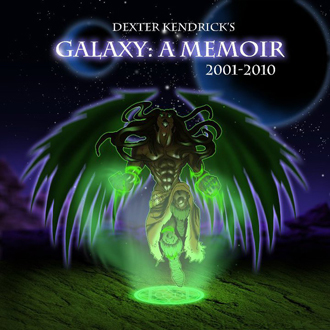 Dexter Kendrick’s stars aligned during the production of Galaxy: A Memoir 2001-2010, making it one of the best current albums in the area. The Harrisburg-based singer/songwriter uses otherworldly references to give his music depth. Self-proclaimed aliens (Lil Wayne) and space cowboys (Jay Kay from 90s group Jamiroquai) have succeeded with this left-of-center approach. Kendrick does, too. He explained why he named some of the titles “Saturn’s Moon (Janus) and “Galaxy:” “Not only am I a musician, I am also a student and practitioner of astrology for almost 10 years,” he said. “With the deep wisdom and insight [astrology] has offered me, I think it was inevitable that titles such as those would manifest in my musical workings. The melodic breakup songs “Goodbye” and “Time” help anchor the album’s airtight production. But Kendrick still creates good music when he’s questing for love. The baby-making “Rapture” and surreal-sounding “Need Love ” justify that. On “Need Love,” the song’s producer uses a clever technique in which a sound is recorded backward then played forward onto the track. The producers also sample gems from A Tribe Called Quest (“The Calling”) and Roy Ayers (“Hope”). Did you write all the songs on your album? I wrote and co-wrote on all the songs on this album. Are your lyrics from personal experiences? Many of my lyrics are from personal experiences, and some are from the experiences of others that have inspired me. Some very talented producers and deeply respected colleagues in this music game: Kevin “Gripp” Gripper, Dennis “Aganee” Jenkins, Fred Graves and Geovanni “Nu Era” Green, to name a few. What do you hope people gain from your album? I hope it’s the best 58-minute ride my listeners have had in a long time—LOL. Seriously though, the treasures alive in this project cannot be spoken, only experienced. Who are your favorite local artists? My ultimate favorite local artist is my close friend, muse and business partner Lei Row. Together, she and I form Polarity Music Group, and both of our musical careers have been a long time in the making. There is much work before words attach to beats and form song. Also, I recently heard a copy of W.O.P.’s Work Over Pleasure, and I have gained a newfound respect for the hip-hop movement in the Harrisburg area. Who are your favorite national recording artists? Carl Thomas; Chaka Khan; Willie Hutch; Earth, Wind, & Fire; War, Eddie Kendricks; Teena Marie, the list goes on and on. What do you think about the quality of today’s urban music? How far do you plan on taking your music career? I come from a family of musicians, with each generation taking their craft further than the previous one. I find that I’m at peace when I’m in alignment with this legacy. My seatbelt is fastened, and I’m ready for where this path leads me. Go to cdbaby.com to preview and purchase the cd now!